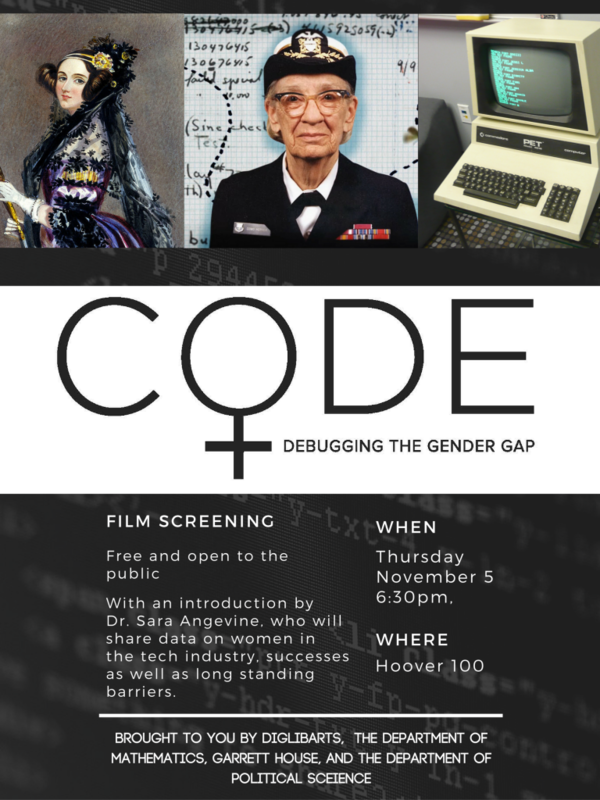 Join DigLibArts, the Department of Mathematics, Garrett House, and the Department of Political Science for a special screening of CODE: Debugging the Gender Gap on Thursday, November 5th, at 6:30 pm in Hoover 100. The film screening will be preceded by a short talk and discussion led by Dr. Sara Angevine, Visiting Assistant Professor of Political Science, who will present some data on women’s leadership/success in the tech industry- as well as the long standing barriers. Dr. Bill Kronholm will also provide information on the Center for Engagement in the Community’s Artemis Program and the PLEN program, a seminar by the Public Leadership Education Network that gives college students the opportunity to hear from leading women in the STEM industries. Coffee, tea and cookies will be provided! Andrea Rehn is Associate Dean and Director of Whittier's Digital Liberal Arts and Whittier Scholars programs. She is also Professor of English, where her research focuses on the long nineteenth century. Her publications include articles on Austen, Conrad, Kipling, and digital pedagogy. She blogs intermittently at andrearehn.com, or find her regularly on Twitter and Medium as @profrehn.